Taking medications correctly is an important aspect of treatment for any illness, but when there are multiple pills to take at different times of the day, it can become confusing, especially for people with mild cognitive impairment, Alzheimer's or another kind of dementia. 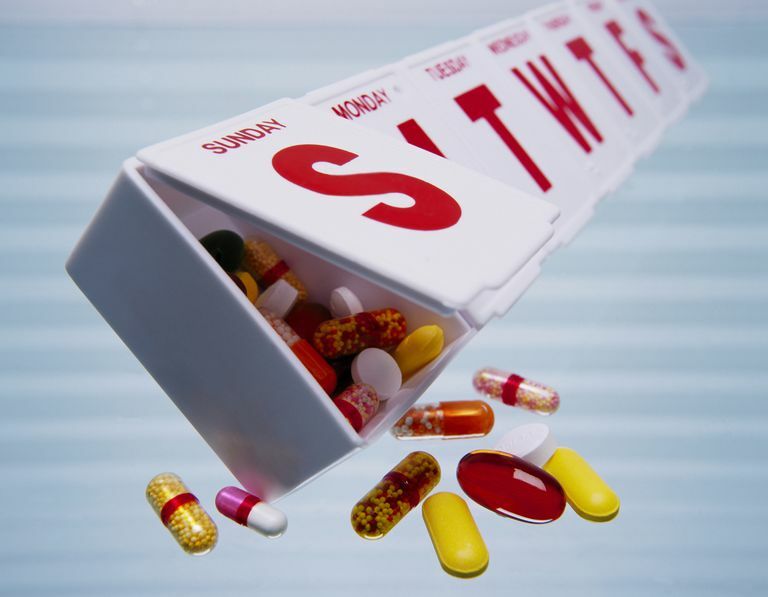 Some medications are ordered for three times a day, while others are taken on some days and not taken on other days. Since many people are on several medications, a pill dispensing system can often be helpful. Many overdoses and sub-therapeutic medication levels (not enough of the medicine) are due to forgetting to take medications, forgetting that the medicines were already taken and taking them again, taking them at the wrong time, or taking the wrong dosage. To decrease the chance of medication administration errors, many people rely on a medication box or dispenser to assist them. Family members can set up the medications ahead of time, or if they are unavailable, you can hire someone from a home health care company to provide this service. There are several different types of medication dispensers. They range from the simplicity of a pill box to a complex, programmable dispenser run by a mini-computer or controlled remotely that automatically dispense pills at the right time and alerts a caregiver if the pill is not removed (and hopefully taken) by the person. Here is an overview of a few of the kinds of pill boxes and dispensers available. There are several different kinds of pill boxes available. The most basic consist of a group of seven plastic compartments in which you can place pills for each day of the week. Some people use two sets of these and have them marked with am and pm, or morning and night. Pill boxes also come with separate compartments for several times a day, such as breakfast, lunch, dinner, and bedtime. You can also find larger boxes that allow you to set up medications for a month at a time. However, with someone who has dementia, you will want to use caution in setting up that many medications all at once. Be sure to monitor the pill boxes for appropriate usage. Some of the monthly organization systems have a dispensing system that allows you to just push a small lever and the correct medications (that have been pre-set) fall out. This can help those who may have difficulty in opening a traditional pill box. With this type of medication organizer, you can set up the medications ahead of time in separate compartments as above; however, this system allows you to set an alarm for each time of the day that medications need to be taken. If you don't acknowledge the alarm, it will continue to beep every so often until you do. While this system doesn't ensure correct administration, it can be very helpful to those who simply need a reminder as to when it's time to take their medications throughout the day. A more expensive but secure option is a locked medication dispenser. This type of system allows you to pre-set medications in a locked box system which will dispense them up to four times a day. An alarm alerts the person that it is time to take the medications and will sound continuously until the box with the medications in is removed and reloaded. This type of medication system can be very helpful for people who tend to take extra medications when feeling anxious or in pain, or for those who have Alzheimer's disease or another type of dementia where memory or orientation is impaired. Some automated medication dispensers can be programmed to alert a caregiver if medications have been missed. This option provides an additional safeguard; not only are you ensuring that your loved one received her medications, it's also another way to make sure she is doing well that day. For example, if she fell and was not able to get to the pill dispenser, it would alert you to a concern since she didn't take her medication. Some caregivers will call their loved one at the time the medications are supposed to be taken to provide a reminder. Technology also enables a computer or phone to alert you at the time medications are due.